Katherine McCaston has over 18 years of experience in anthropology and international development. For 11 years, she worked as Senior Management Advisor for CARE, one of the largest international relief and development organizations working to end global poverty and promote social justice. Kathy’s experience spans a range of fields related to anthropology and international development, including political science, women's studies, and medical anthropology. She has expertise in sustainable livelihood security, rights-based approaches, municipal & civil society strengthening, maternal & child health, agriculture, and food aid. She has worked in 33 countries in Latin America, Africa, and Eastern Europe. 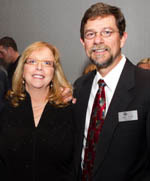 Beginning in 2003, Kathy was asked to lead and manage a major paradigm shift related to CARE's programmatic framework. She led the development of the Unifying Framework for Poverty Eradication & Social Justice, which is a conceptual model that links needs-based (livelihoods, health, education, water, sanitation, etc.) and rights-based programming into a coherent and mutually reinforcing development framework. The framework has become the cornerstone of all CARE programming and the foundation of CARE's approach. Kathy left CARE in 2008 to be able to pursue more local, US-based work. She is an adjunct assistant professor at the LBJ School of Public Affairs at the University of Texas. She also works as an independent consultant for both US-based and international development firms. Much of her work is home-based research, development of training materials, technical writing, and grant/proposal development. Kathy averages 2-4 international consultancies per year and stays current on international development issues, policies, and advocacy efforts.